Vivienne Marcheline Jolie-Pitt (born July 12, 2008) is the daughter of celebrity super-couple Brad Pitt and Angelina Jolie. She has a twin brother named Knox. 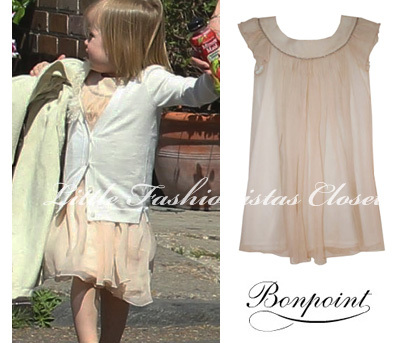 Vivienne wore Peachy Chiffon Dress by Bonpoint and Waterfall Cardigan by Crewcuts, while shopping in New Orleans with her big happy family on March 20, 2011. Vivienne was wearing Pink Eyelet Ruffle Tank from Coral line by GAP, while leaving Eden Superbowl on Malta on June 30th 2011. Vivienne Jolie-Pitt in Old Navy! 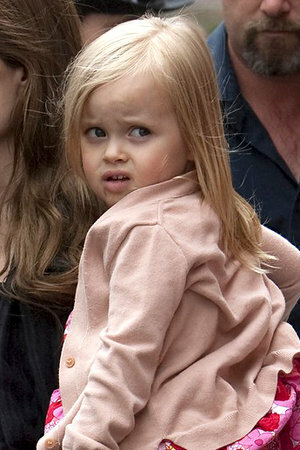 Vivienne Jolie-Pitt was wearing a Rose Print Rosette Dress by Old Navy, while playing at the park in LA on May 2nd 2011. Vivienne was wearing Lily Embroidered Dress in Oyster by Stella McCartney, while exciting the bowling alley on Malta on July 6th 2011. Vivienne was wearing White Tulle Layered Top from Pirouette line and Ecru Crochet Espadrilles from Seychelles line, both by GAP (sold out online); while having at Marine Park on Malta on June 27th 2011. 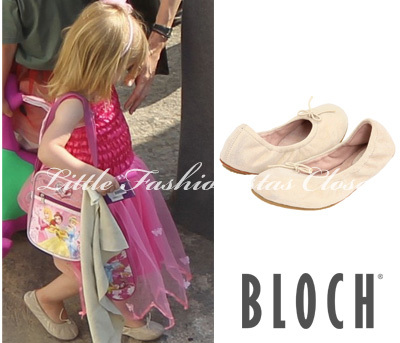 Vivienne was wearing Sirenetta Ballet Flats by Bloch, while playing dress-up with her siblings on Malta on June 15th 2011.